Skydiving is perhaps the most exhilarating adventure sport available to man and Australia offers some great places to make the skydiving dream come true. With multiple companies spread across all corners of the country, skydiving is available in many picturesque coastal and inland settings. Skydive Mission Beach is regarded as one of the most beautiful jumps in Australia. Its position between Cairns and Townsville essentially means that you will enjoy devastatingly beautiful coastline as you fall through the air from 9,000, 11,000 and 14,000 feet. Popular among those who have dived before, the Wollongong Beach Skydive is one of Sydney's only beach dives and offers spectacular views of both the city and the coastline. Marvel at the spectacular range of beaches, lagoons and waterways and breathe a sigh of relief as your feet touch the pure white sand back down on land. Skydive in Australia's top end when you depart from Darwin Airport and fall through the sky all the way to the stunning Lee Point Beach. The serenity of the area around here makes for a pleasant view from the top; one that is not interrupted by countless buildings and industry. Byron Bay is Australia's eastern most point and is a truly extraordinary place to visit (both from the ground and the sky). Skydive Byron Bay owns the safest and most reliable plane in the world, making it a popular choice for large groups and those a little more hesitant than others. As one of Victoria's most recognisable beaches, Bells Beach is an extremely popular spot for tandem skydiving. Branded the experience of a lifetime, this dive will offer you unsurpassed views of the Great Ocean Road, which is of course home to some of the country's most amazing beaches. Discover the highlights of the Fraser Coast when you skydive from Queensland's Hervey Bay. Enjoy striking views of Fraser Island, the world's largest sand island, as you descend from up to 14,000 feet. 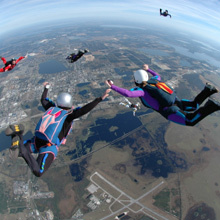 Skydive Sydney is Australia's largest skydiving company and caters for just about any kind of dive. Enjoy superb views of the Sydney CBD, with highlights like the Sydney Harbour Bridge and the Sydney Opera House sure to make this a dive to remember. New Zealand is another country that is well known for its sky diving opportunities. Plan your holiday to New Zealand and book campervan Christchurch today.